Broccoli cheddar soup is a yummy staple in our winter meal cycle, but throw it all into a bread bowl and our love for the dish skyrockets. We scarf it down and then immediately plan out when we’ll get to have it again in the (very) near future. It’s possible you are not quite as big of broccoli cheddar– or soup– enthusiasts as we are, but we guarantee you’ll flip for this rich and creamy meal. Now, everyone knows that soup is the perfect dish for when the weather takes a turn, but this recipe will give you a hankering for it even when the weather’s perfect; it’s just that good. Plus, it’s a perfectly easy soup to make and only dirties one pot. Clean up is seriously a breeze, because, chances are, you’ve eaten up your soup vessel, leaving only your spoons for the dishwasher! Dust off your soup pots, you know what you’re making for dinner tonight! In a large pot or Dutch oven, cook bacon over medium-high heat until thoroughly browned and crispy. Remove to a paper towel-lined plate to drain. Add onions to bacon renderings and cook until softened and transparent, 5-7 minutes. Add garlic to the onion and cook for 1 minute, or until fragrant. Stir frequently so it doesn’t burn. Whisk in chicken broth, then milk and cream, and add broccoli. Bring mixture to a boil, then reduce and let simmer for 20 minutes, or until broccoli is tender. Take your bread bowls and gently scoop out the bread from the inside, leaving about 1/4-inch all the way around. Set bowls aside. In batches, transfer soup to a blender (or use an immersion blender) and puree majority of soup until almost smooth, leaving some chunkier parts. Return to pot. Using a fork or whisk, mix together cornstarch and water in a small bowl or glass until smooth. Then add this slurry back into the soup and stir well to incorporate. Bring soup back up to a boil and let cornstarch cook, then stir in cheese and season with salt and pepper. 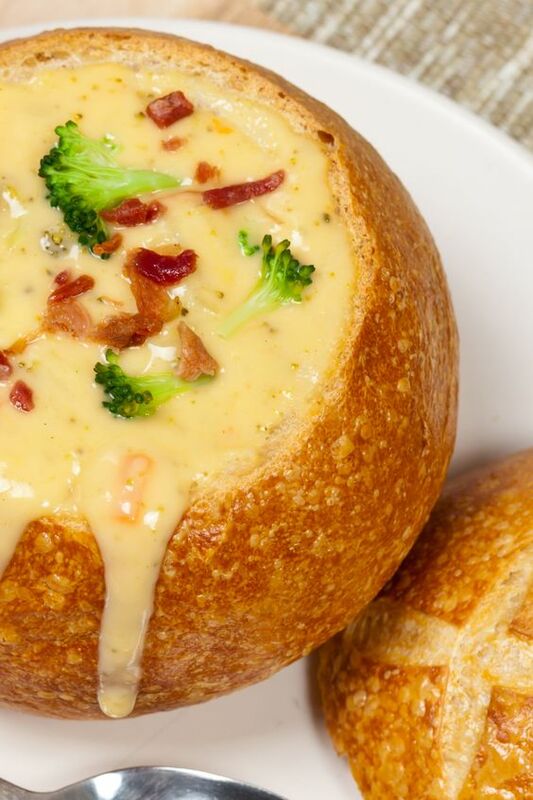 Ladle soup into bread bowls and garnish with extra broccoli and bacon. Serve immediately and enjoy. 0 Response to "Bacon Broccoli Cheddar Bread Bowl"